Whether it’s mini rolling suitcases or mini bird’s nests, the smaller the favor the cuter it is in my book. Of course, it also has to be useful in some way or at least filled with something yummy. 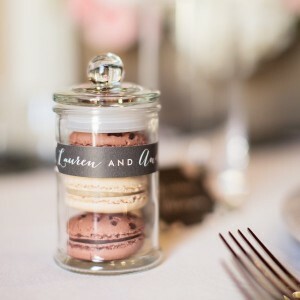 Which brings me to today’s fun mini wedding favor – mini apothecary jars with lids! These are so cute and fun and you could fill them with just about anything. I personally love the idea of filling them with macarons because they’re all the rage right now and they’re delicious. But these mini jars would also be so cute filled with Jordan almonds, M&Ms, chocolate kisses, or any other variety of candy or sweet treats. The possibilities are endless. To add to cool factor you could also create personalized labels for the jars. And your guests can take them home and reuse the jars in the kitchen, bathroom, or craft room. They’re fun and functional! If you love these jars as much as I do, you can find the mini jars here!